The market for energy storage on the power grid is growing at a rapid clip, driven by declining prices and supportive government policies. Based on our research on the operation and costs of electricity grids, especially the benefits of new technologies, we are confident energy storage could transform the way American homeowners, businesses and utilities produce and use power. Energy storage in this context simply means saving electricity for later use. It's like having a bunch of rechargeable batteries, but much larger than the ones in your cellphone and probably connected to the grid. After annual average growth of about 50 percent for five years, the U.S. electricity industry installed a total of 1 gigawatt-hour of new storage capacity between 2013 and 2017, according to the firm GTM Research. That's enough to power 16 million laptops for several hours. While this amount of storage is less than 0.2 percent of the average amount of electricity the U.S. consumes, analysts predict that installations will double between 2017 and 2018 and then keep expanding rapidly in the U.S. and around the world. To see why this trend is a big deal, consider how electricity works. It takes a hidden world of complexity and a series of delicate balancing acts to power homes and workplaces because the grid has historically had little storage capacity. After being generated at power plants, electricity usually travels down power lines at the speed of light and most of it is consumed immediately. Without the means to store electricity, utilities have to produce just enough to meet demand around the clock, including peak hours. That makes electricity different from most industries. Just imagine what would happen if automakers had to do this. The moment you bought a car, a worker would have to drive it out the factory gate. Assembly lines would constantly speed up and slow down based on consumer whims. It sounds maddening and ridiculous, right? But electric grid operators basically pull this off, balancing supply and demand every few seconds by turning power plants on and off. That's why a storage boom would make a big difference. Storage creates the equivalent of a warehouse to stow electricity when it is plentiful for other times when it is needed. The U.S. Energy Department’s SunShot Initiative aims to reduce the cost of solar energy and to make it easier to deploy. Energy storage can help in a variety of ways, essentially serving as a Swiss Army knife for electricity grids. It can help balance short-term power fluctuations, manage peak demand or act as a backup to prevent or recover from power outages. And it can be deployed at any scale and at any point in the grid, from a small home storage system to a pumped hydroelectric reservoir big enough to power a small city. While storage actually consumes a little electricity rather than producing any, it makes the electricity business more economically efficient. As the volume of storage grows, we expect grids to become more stable and flexible. Storage may also make a big difference with electricity generated through solar or wind power – which can only be harnessed when the sun is shining and the wind is blowing. But, in general, it isn't necessary for that purpose yet. While those industries are growing quickly, wind power generates only about 6 percent of U.S. electricity and solar less than 2 percent. Electricity grids can currently use almost all of that power as it is produced. Grid operators, accustomed to managing the variable supply and demand for power, can manage the extra unpredictability they get from wind and solar energy now. But as utilities, businesses and consumers bring more renewable energy online, the grid may become harder to balance without additional storage. To be sure, hydroelectric plant operators have been storing power for a long time. 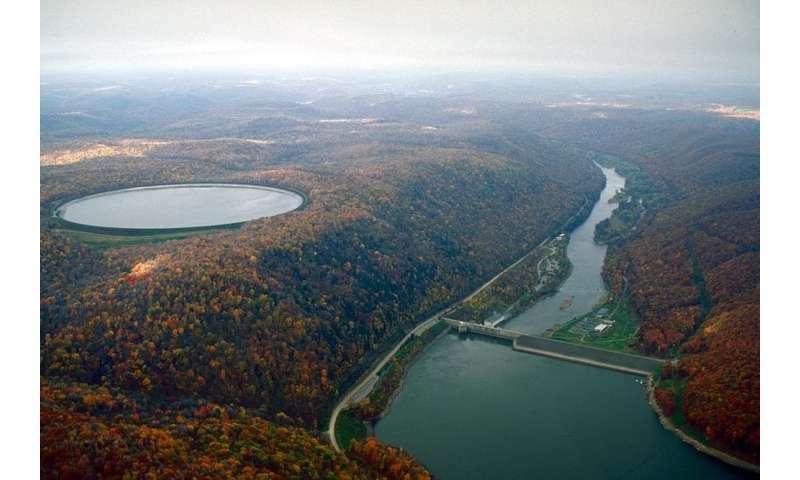 The U.S. has the capacity to store some 22 gigawatts in pumped hydropower, about 2 percent of U.S. generating capacity. Yet its reliance on large water reservoirs, which can't be easily constructed near power markets, limits the growth potential of this energy option. Once energy storage scales up, utilities will meet peak demand more easily with less total capacity and fewer power plants. If they can rely on storage to supply power during high-demand hours instead of building new power plants, it can save money all around. But storage isn't the only game in town – other technologies offer similar benefits. Utilities can install new transmission lines or rely on flexible natural gas, which is essentially the biggest competitor for energy storage. Natural gas generation produces about a third of the nation's electricity today and provides many of the same benefits as storage since these power plants are easy to switch on and off. The relatively low prices for natural gas, less than half of what they were a decade ago due to widespread hydrofracking, have probably slowed energy storage growth until now. Natural gas has become increasingly popular for power generation, displacing demand for coal since 2000. But if storage gets cheap enough, this equation may flip and storage could threaten the economics of natural gas generation. One reason why this industry is growing is that it's getting a boost from the government. California, Maryland, New Jersey and Nevada are subsidizing storage, mandating its adoption or both. A similar measure is pending in Hawaii's legislature. And despite the Trump administration's efforts to maximize fossil fuel extraction, the federal government is now laying the regulatory groundwork for the storage industry to compete directly in open wholesale energy markets for the first time. Improvements in technology have made a difference, too. Battery technology, led by the same lithium-ion design that powers mobile phones, is making big strides and getting much cheaper. Lithium-ion batteries are both responsible for most of this new wave of grid-connected energy storage and the critical component inside the rapidly growing number of American electric vehicles. For example, the lithium-ion battery used in the the Tesla Powerwall, a home battery system, is the same as the one the company uses in its vehicles. Grid-scale lithium batteries often differ from those in cars but use the same basic technology. The price of utility-scale lithium-ion battery systems fell 40 percent in just five years to around US$1,200 per kilowatt-hour in 2015 from roughly $2,100 in 2010 and are expected to continue falling. The grid currently has relatively little storage for the same reason that only about 200,000 of the 17.2 million vehicles Americans bought in 2017 were electric: It's expensive today. Electric vehicles do not yet save money for most U.S. drivers. But market experts project that electric vehicles ownership will cost less than standard vehicles powered by gasoline within a decade and continue getting cheaper after that. 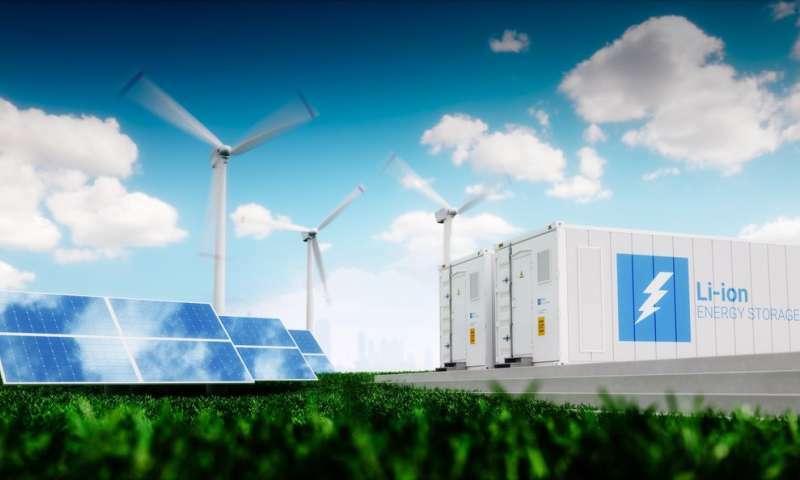 Likewise, for the electricity grid, if storage gets cheap enough, its potential market could expand from 1 gigawatt-hour to dozens or even hundreds of gigawatt-hours. If or when that happens, wind and solar power would become more competitive, increasingly displacing both coal and natural gas – now the nation's two top sources of electric power. And this cheaper storage would also make electric vehicles more affordable, reducing the amount of gasoline and diesel Americans consume. The electricity and automotive industries operate nearly the same way they did 50 years ago. But a world of low-cost batteries would change them both in exciting and unprecedented ways. No matter what happens, we believe that storage is "future-proof" because it works well on the current grid and with a wide variety of other technologies. If the wind and solar industries keep up their current momentum (and they probably will), storage will become even more valuable. But if the grid goes another direction – relying more on large and expensive generation plants, for example – storage would make it easier to manage peak demand without surplus capacity. Even if we can't say exactly what the grid of the future will look like, we are pretty confident that storage will keep it humming in new ways. This is the death of fossil and nuclear power. They will thrash around for a long time until they are wiped them out, like the original dinosaurs. Renewable cultists live in an alternative world. Meanwhile in the real world, the so-called renewable revolution is powered by child labor to produce cheap batteries, poor African children. "many top tech companies use cobalt in their lithium-ion batteries"
Batteries, even at $100/kWh still add another $50/MWh or so to the price of electricity, on top of the cost of the renewables themselves. They don't compete with gas power which comes at $40-50/MWh as it is. The idea is that batteries displace more expensive load following power to compensate for the variability of renewables and thus they may become competitive, but the point is moot: if renewables aren't used, there's no need for so much load following and gas becomes cheaper: the solution is creating its own problem. And that's what's going on on the market. Renewables get subsidized into existence to give a few rich investors money, while the actual power is increasingly being generated by gas. The issue is that gas is currently very very cheap. Gas is so cheap that even people who pretend to be "green", like gkam by his own admission, install gas water heaters for their showers instead of electric storage boilers which would act as energy storage. After all, if they did the right thing and actually used their own renewable power, they wouldn't get net metering and free electricity from the grid, which would push the system payback to "never". The generators are the expensive part, and with less load following to do, you can build cheaper generators with higher efficiencies and thus lower power prices, and ironically also lower emissions as the generator efficiency goes up. BS! I do not use net metering to get any money from anybody. I produce power at peak for my neighborhood but only take back cheap power, but trade it one-for-one! Do you use 100% pure nuclear power? You don't take money, you take free electricity, and that's the same thing. By sending out power to the grid, you get back free electricity which would otherwise cost you around 14-18 c/kWh. For what energy you don't get free from the grid, you buy natural gas which costs you around 6-7 c/kWh. If you were to have a hot shower with your solar power, it would be worth half as much for you. That's why you burn gas instead of storing the energy. I mainly use hydro, nuclear, and bio-energy in the form of forestry waste. About 25% each with a little bit of wind power thrown on top - the remainder comes half-and-half from gas and coal. 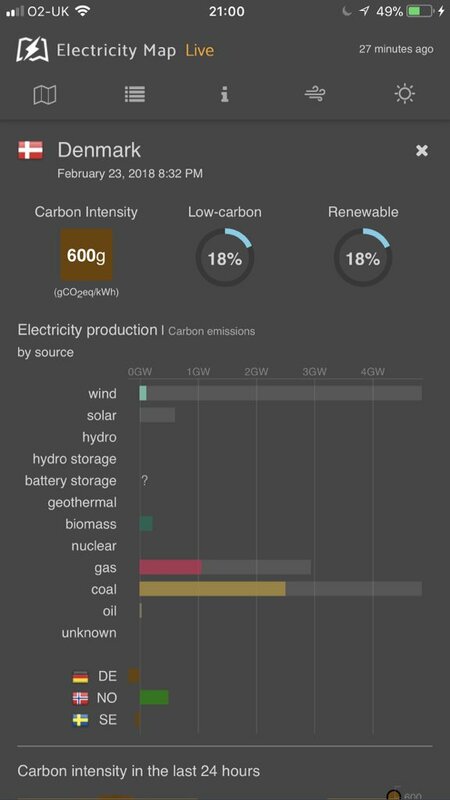 27g/kWh with wind, hydro and nuclear. 354 g/kWh with wind, gas and coal. Even though wind power is currently generating half the capacity, the coal power really puts the emissions up. 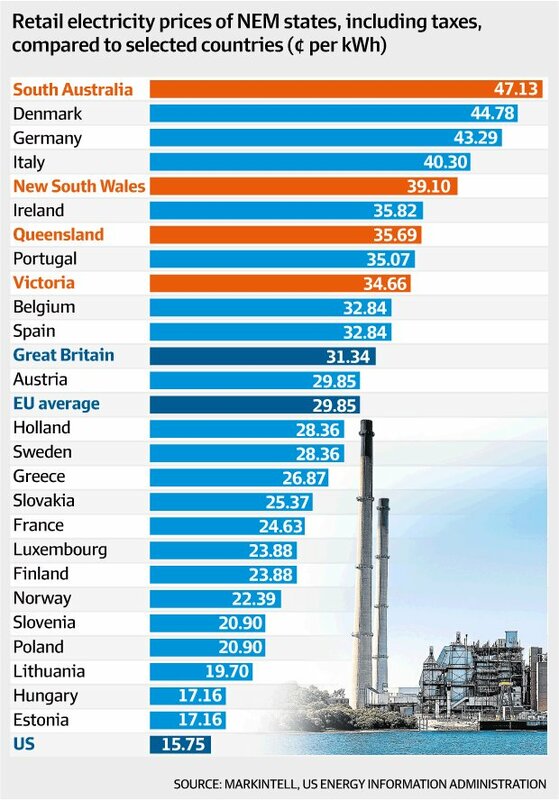 They'd do much better to switch from coal to gas like California did, but the gas prices in the EU are too high, thanks to Russia. @Eikka's lying about renewables. Again. And got caught. Again. I thought the target would be reducing emissions and electricity prices, not bird-choppers/landscape-destroyers expansion and costlier electricity bills. 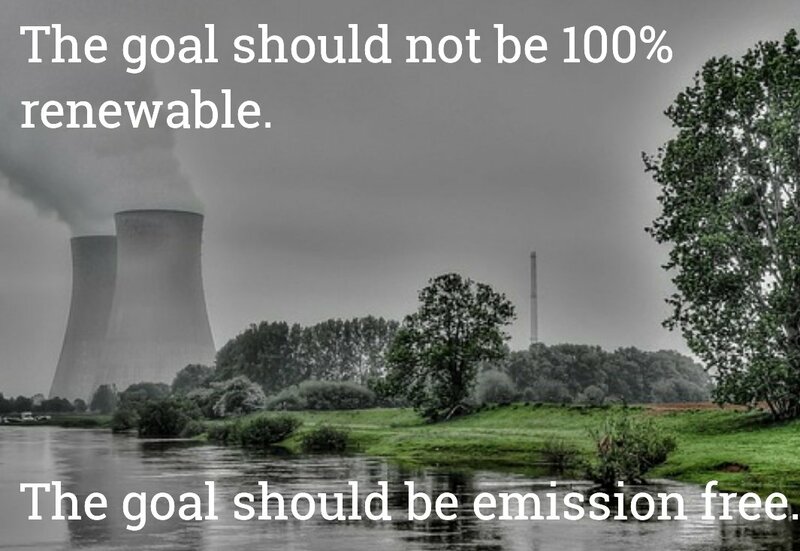 "Better to target zero emissions than 100% renewable energy"
We don't need no stinkin' coal. Don't need no dangerous nukes. Because you have natural gas(methane/fracking) to prevent people from freezing in the dark mainly during the Winter when wind isn't blowing or sun isn't shining. You still need a lot of coal and other fossil fuels to manufacture/transport/install/recycle the batteries, and African children to mine cobalt. "Industrial wind turbines and solar panels cannot be manufactured, transported or erected without using massive amounts of fossil fuel." "More research shows that batteries aren't necessarily helping decarbonize the grid. In many cases, according to a team from the Rochester Institute of Technology, batteries are making it dirtier."